When and where I grew up — suburban New York in the 80s — boys were socialized to care about sports above everything else. And while I never really took to football, basketball, hockey, or soccer, I was raised on baseball. Sports talk was the lingua franca of boys’ communication, requiring a facility in at least faking the ability to talk about the various teams, players, and storylines. I didn’t even have any sweet style to fall back on. The other staple topic of discussion was Star Wars. I was 4 when it first came out, and one of my earliest memories is of my fifth birthday, when my parents took me to see it at a drive-in. It’s fun now, with the rise of fandom and fan studies, to use that language to recontextualize all of those early fannish experiences. Star Wars is certainly one of the ur-texts of modern fandom, but a lot of the same dynamics can be found in sports fandom. After all, what is sports-talk radio but an aural version of tumblr full of 24/7 fandom dramz? Come to think of it, why don’t we have fan radio — like sports radio but with shows about Superwholock, 1D, ship wars, etc.? SiriusXM has to have bandwidth to hire a bunch of podcasters and give them a channel. My 2016 fav list initially had only one sports-related moment on it, but like a Mets pitcher’s hair or a Bartolo Colon waistline joke, it just kept growing. And so Part 2 (of what now appears to be a 3-part series) is now focused on my two oldest fandoms: the New York Mets and Star Wars. These two topics have more in common than you might think: a motely rag-tag crew comes together to achieve what seems to be impossible. It helps the metaphor that the team across town cheerfully takes on the role of Evil Empire. So, here follows four Mets moments and one Star Wars work that kept my fannish heart pumping in 2016. Growing up a New York Mets fan is like being indoctrinated into a cult of futility. We expect bad things to happen to us, we’re always waiting for the other shoe to drop, for our hopes to be dashed. But every so often, the baseball gods let us bullseye a womp-rat in a way that’s so improbable, so unlikely, and so dramatic, that it keeps us on the hook for another couple of decades. 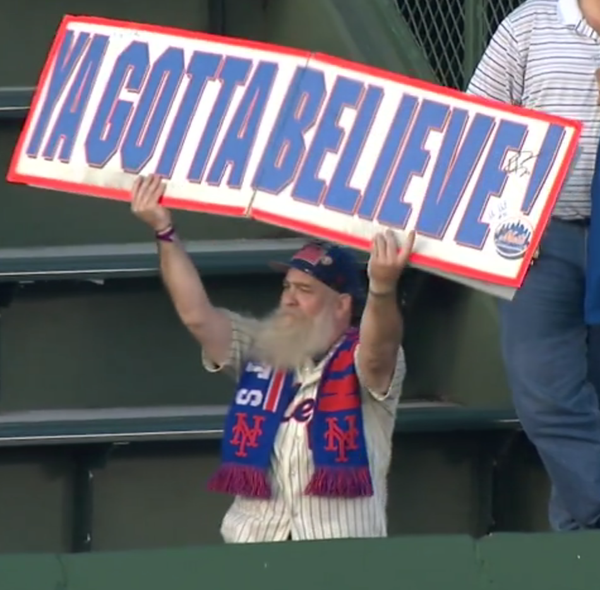 To be in the Mets fandom is to believe in the Force, to know that miracles are possible —even if most of the time they don’t. In 2015, there was one of these perfect Mets-ian confluences: a trade fell though in bizarre fashion, a hasty replacement deal was slapped into its place, and the team ended up with enigmatic Cuban nerf-herder Yoenis Cespedes. It’s always interesting when a player earns the label “enigmatic” — it’s usually code for “we’re still trying to fit him into some familiar, coherent narrative.” If you’re versed in Mets lore, you’d know there were only two possible outcomes — a total bust, or an epic triumph. Somehow, improbably, it turned out to be the latter. 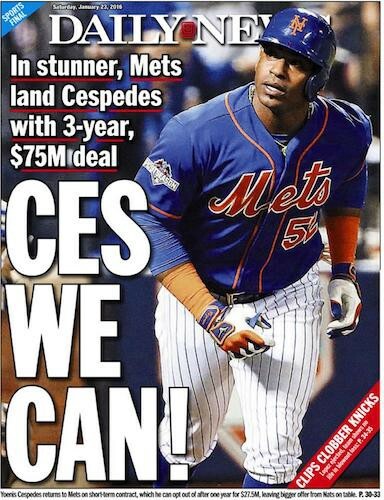 Cespedes galvanized the team all the way to a National League Pennant, in the process becoming the marquee attraction, the rare player so dynamic that you had to tune in for every at-bat because he was capable of making something incredible happen at any moment. He could even attract wildlife like a Disney princess. 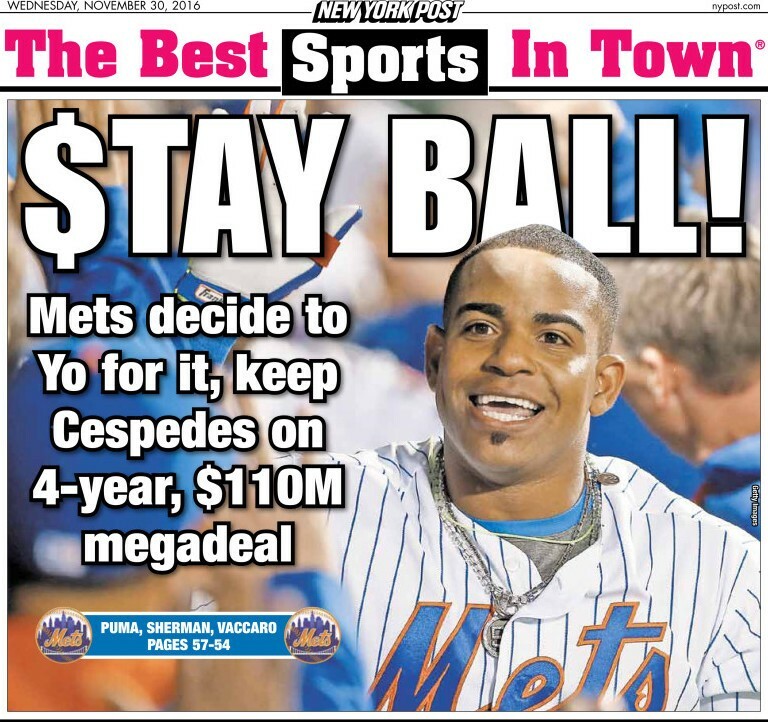 Of course, the Mets lost the 2015 World Series and because they rarely ever open the coffers to sign free agents, I was resigned to the fact that the brief, shining Cespedes era was over. Like all good scoundrels, he expected to get paid. Until, one day in January, the thing that Mets fans never dreamed would happen, happened. New York tabloid back pages are simultaneously the highest and lowest form of punnery. This was unprecedented. It almost made up for losing the World Series. Every Mets fan I knew was giddy. And it didn’t matter that it was really just a one-year deal, after which he could opt-out and re-enter free agency. One year was all we needed to take the next logical step and win it all. Of course, this is the Mets we’re talking about. So 2016 did not turn out to be a march to a championship, but rather a never-ending bacta tank; everybody got hurt, then their replacements got hurt, then their replacements got hurt too. Somehow, they miraculously limped into the wild-card game, but were quickly dispatched. And with the end of the season, Cespedes predictably opted out; again we thought his time with the team was through. Even though many Bothan spies reported rumors that he loved playing in New York and would stay if they would give him a long-term contract, we never expected that to ever happen. It’s entirely possible that this will not work out well, that with the security of a long-term deal Cespedes will underperform. Or he’ll get hurt or for some other reason never approach the dominance of 2015. But that’s irrelevant. Because a baseball time, like a rebellion, is built on hope. Spring training starts in 6 short weeks and I can’t wait. It’s not just a slogan, it’s a way of life. Mike Piazza is simply the best baseball player I’ve had the opportunity to watch on my team. He was simply on another level from everyone else. Piazza’s tenure with the Mets occurred at a very important time in my life. After my childhood fandom cooled during college and grad school––and a particularly wretched and embarrassing period in team history — I moved back to New York and discovered my baseball fandom as an adult. So many important things happened in and around that team in that period of my life: my first marriage, being able to take my father to his first World Series game in 2000, and the aftermath of 9/11. I was at Shea Stadium for the game on September 21, 2001, the first public sporting event in New York after the attacks. It remains one of the most profound, emotionally charged moments of my life. A few years ago, Mike Piazza published a memoir. He did a signing nearby, and I waited on a very long line to get him to sign his book. In the few seconds I had, I was able to tell him that I had been downtown on 9/11, and I had been at that game, and to thank him for what he did. And he shook my hand and said, “No, thank you.” Take that, Josh Lyman. Bartolo Colon’s first career homerun. The longest run around the bases in history. The sheer joy it brought everyone involved. The only thing that would have made this better if I’d been there — I had tickets to this game, but decided not to make the drive down to San Diego. My big, big loss. I think my favorite part is the utter disbelief as announcer Gary Cohen’s voice breaks on his trademark “It’s Outta Here!” call. Bartolo was in the middle of this one too––a much sadder occasion, and another example of how fandom can bring people together to grieve a tragedy. After the star pitcher Jose Fernandez was shockingly killed in a boating accident, the Marlins played their next game against the Mets, and I have never been so happy for my team to lose a game. If this doesn’t make you emotional then, god, Jed, I don’t even want to know you. Social media storytelling is HARD. Anybody can start a twitter account and flood their feed with content, or broadcast bits of intimacy on snapchat. But the real gold, the larger challenge, is the slow, long, unfolding portrayal of a character — the identification of a voice, the ability to convey that voice across a wide range of subjects, to world-build through first-person observation, to reveal layer after layer of a character in compelling morsels, and above all the commitment to tell a story over the long-haul, to eschew the weaponized lust for immediate likes and retweet in order to build something larger, longer, deeper and more meaningful. Early in 2016, I stumbled across a Tumblr that accomplishes all of this, at an extraordinarily high level. With the release of “The Force Awakens” at the end of 2015, one of the biggest questions in the Star Wars universe became “What happened to Ben Solo that turned him into Kylo Ren?” Ask Ben Solo is one fan’s answer to that question, an ongoing exploration of young Ben’s mind — beginning as a seemingly-normal teenager grappling with regular teenage problems. But as we get to hear Ben’s day-to-day challenges though his words and drawings, the unusual circumstances that he faces begin to emerge: the difficulty of having galactic heroes for parents and a crazy wizard for an uncle; the pressure of a seemingly-predestined Jedi path laid out before him; and most disturbingly, the looming specter of his frequent nightmares––that may originate from an external source bent on warping his mind. All of this is conveyed with clarity, emotion, and fidelity. Whatever will eventually be revealed as the canonical origin of Kylo Ren, it’s hard to imagine that it will be as compelling and heartfelt as this website. I’ve read a lot of official Star Wars novels over the years. 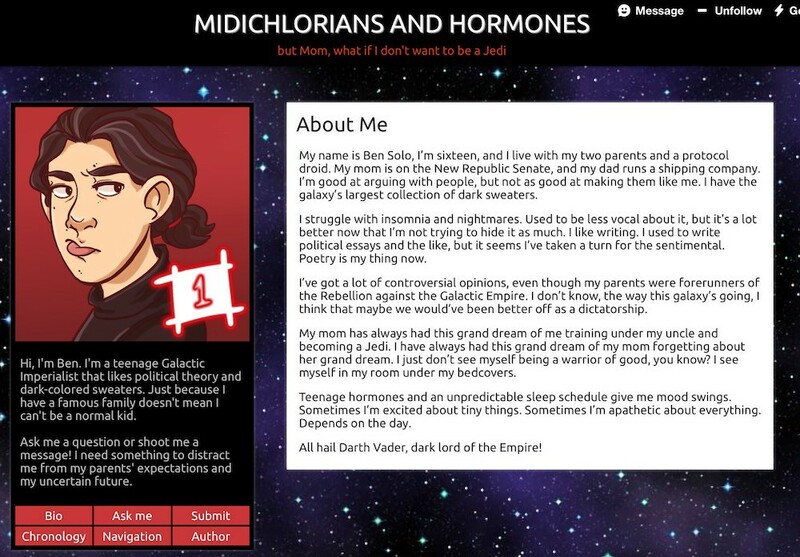 “Ask Ben Solo” is better than most of them. Written by a self-described “seventeen-year-old girl who, like Ben, is an intellectual introvert,” her site recently marked its one-year anniversary. Let’s hope it continues on for much longer. With the recent electoral catastrophe, one of the goal of our new Imperial Senate will be the rollback of the hard-won Net Neutrality protections. When those rules were being considered back in 2014, the Writers Guild included some of my comments in their filing with the FCC, in which I described any kind of paid-prioritization shceme as “an extinction level event for an entire generation of creators.” “Ask Ben Solo” is precisely the kind of work that must be encouraged, protected, and allowed to fourish. Part 3 coming sometime in the next week. Unless I think of more, it’ll be four entries: a writer, a tv show, an internet kerfuffle, and a personal milestone. Emmy Award-winning producer and writer. Maker of original interactive & multiplatform stories. Amateur Aaron Burr apologist.